Home / GST-Tally / Tally Updates / Whats New in Tally.ERP 9 Release 6.3? 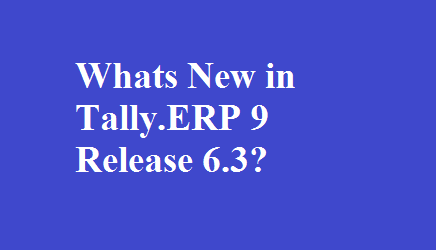 Whats New in Tally.ERP 9 Release 6.3? The due date for filing GSTR-3B for every month is on the 20th of the subsequent month. For Nov. 2017, the due date is 20th Dec. 2017. We have made four key enhancements in Tally.ERP 9 Release 6.3. Make your customers happier by printing invoices with complete item-wise and rate-wise tax breakup details. You can see tax details (CGST, IGST, SGST, Cess) individually for each line item. Press F12 - Enable Print Item-wise GST details. Tally.ERP 9 automatically changes the print setting to Landscape. As per the announcements made in the 23rd GST Council Meeting, regular dealers with turnover less than 1.5 Cr have to file GSTR-1 on a quarterly basis. As soon as this feature is enabled in the GST portal, you can generate your quarterly GSTR-1 return from Tally.ERP 9 Release 6.3 as well. In Gateway of Tally, F11 - F3 - Statutory details. Choose: Set/alter GST details. A new option, Periodicity of GSTR-1 is available. Select Quarterly here. Tally.ERP 9 Release 6.3 has enhanced the GSTR-3B with a new inclusion of Table 5.1 Interest and Late Fees Payable. You can record details of any interest or late fees that you might have to pay here and keep your books updated. ● In a POS invoice with a voucher class, if a godown was selected for a stock item, the MRP did not appear in the Rate (Incl. of Tax) column. This issue is resolved. ● Sales recorded with the nature of transaction Sales to SEZ - Nil Rated, and sales of nil rated stock items made to SEZ party did not appear under Outward taxable supplies (zero-rated) of GSTR-3B. This issue is resolved. ● The state name of the consignee appeared for the buyer in the Party Details screen of the sales invoice when the party's ledger name and the mailing name were different. This issue is resolved. o The error Country, state and dealer type not specified appeared in the Tax Analysis screen of the purchase invoice. o Central and state tax was calculated instead of integrated tax when the e-commerce party was of another state. ● If the Address Type was changed in the Party Details screen of a credit note, the GSTIN of the primary address type appeared instead of the selected address type. This occurred when the invoice was configured to display buyer and consignee details. This issue is resolved. o The values appeared in the 3.2 - Supplies made to Unregistered Persons section of the GSTR-3B report. o The tax amount was not displayed in the Invoice Amount column of the Adjustment of Advances - 11B(1), 11B(2) section of the GSTR-1report. ● If a bank ledger was selected in the purchase or sales voucher, the GSTIN defined in the bank ledger was not displayed in the Party Details screen. This issue is resolved. ● The message Error in TDL was displayed in a POS invoice, if a voucher class was selected, and the Party's A/c Name was set to Not Applicable. This issue is resolved. ● In a POS invoice, the Rate (Incl. of Tax) entered for the stock item in the previous invoice appeared when the same stock item was selected in the subsequent invoice. Also, if the Rate (Incl. of Tax) was changed, the Rate per unit of the previous invoice was retained. This issue is resolved. ● In a company data enabled with multiple mailing details, the error Memory Access Violation appeared while selecting a party in the Party Details screen in the voucher mode of a purchase transaction. This issue is resolved. ● If a voucher class with a GST discount ledger was selected in a sales invoice, the discount value did not appear when the State selected was Delhi, Gujarat, Himachal Pradesh, or Rajasthan. This issue is resolved. ● When a bank name with GSTIN was entered in the Party Details screen of a payment voucher (recorded with the GST, bank and party ledgers), the party name appeared in Voucher Register of B2B Invoices. This issue is resolved. ● The expiry date of the stock item appeared only partly in the HSN/SAC column of the printed invoice. This issue is resolved. ● You can print the GST analysis of taxable purchases under reverse charge made from unregistered dealers, if you set the option Enable tax liability on reverse charge? (Purchase from unregistered dealer) to No in the Company GST Details screen. These purchases are not captured under Value of exempt, nil rated and non-gst inward supplies of the GSTR-3B report. ● If the stock items selected in a sales invoice had the same cess and tax rates but different quantity per unit, the cess on quantity was not displayed separately in the GST analysis section of the printed invoice. This occurred when the stock items were defined to calculate the cess Based on Value and Quantity. This issue is resolved. ● The error The voucher number should not exceed 16 characters appeared while saving a sales invoice that was configured with Multi-user Auto as the voucher numbering method. This occurred if the total of alphanumeric Prefix, Suffix, and the Width of the Numerical Part was 11 or more characters. This issue is resolved. ●The state name and code appeared in the payment voucher printout, when the option Print State Name & State Code? was set to No in the printing configuration screen. This issue is resolved. ● While recording a cash transaction for an advance receipt, if the party ledger of a party belonging to another state was selected in the Party Details screen, the cursor was skipping the Place of Supply field. Also, the Summary of Tax Liability section of the Advance Receipt report appeared blank for such transactions. This issue is resolved. ● In an interstate sales invoice, if the Name and Mailing Name of the party ledger were different, the Place of Supply displayed was incorrect. This issue is resolved. ● In the alteration mode of a zero-valued cash sales invoice, if a party ledger was selected in the Party Details screen, the GST Registration Typeand GSTIN/UIN of the party did not appear. This issue is resolved. ● The e-Sugam no. is renamed as e-Way Bill No., as per the latest requirements of GST invoice of Karnataka. ● You can print the GST invoice in the landscape orientation by enabling the option Print Item-wise GST details?. The printed invoice will display the assessable value by including the apportioned additional ledger amount, and the breakup of GST, for each stock item. ● While printing the GST invoice in landscape orientation, you can print the discount amount apportioned for each stock item in the invoice. ● If you specified a union territory as the state in the Company GST Details screen, the tax type in the printed POS invoice appeared as SGST instead of UTGST. This issue is resolved. ● If a voucher class was selected in a sales invoice that was enabled to print after saving the details, the tax rate defined for the additional ledger appeared in the tax analysis section of the printed invoice even if the expense or income amount was not specified. This issue is resolved. ● While printing an interstate sales invoice from Multi Voucher Printing, if the Place of supply was within the state, the buyer's state appeared as the Place of Supply. This issue is resolved. ● You can generate the GSTR-3B returns in the JSON format from Tally.ERP 9, and directly upload it to the GST portal. You can also export the data in the MS Excel offline utility tool provided by the department. ● Taxable supplies or sales made within the state to unregistered dealers, composition dealers and UIN holders, appeared under section 3.2 of GSTR-3B report. This issue is resolved. ● When the Document Summary of the GSTR-1 report was exported in the MS Excel format, the details of the column No. of Vouchersappeared under the column No. of Cancelled Vouchers. This issue is resolved. ● Experience a significant improvement in the time taken to re-accept the voucher, after changing the HSN/SAC details when you drill down from the HSN/SAC Summary of the GSTR-1 report. ● In a particular company data, the error Memory Access Violation appeared while opening the GSTR-2 report. This issue is resolved. ● In a particular company data, the error Memory Access Violation appeared while importing the GSTR-2 file downloaded from the GST portal. This issue is resolved. ● In the drill-down reports of the GSTR-1 report, if an invoice was opened in the display mode and printed, the tax rates appeared incorrectly in the GST analysis section of the printout. This issue is resolved. ● In the PDF file generated for GSTR-3B, the values did not appear in the relevant columns due to incorrect alignment. This issue is resolved. ● In the stock item view of Purchase from URD - Reverse Charge Liability, the details did not appear in the relevant columns due to incorrect alignment. This issue is resolved. ● In the HSN/SAC Summary of GSTR-1 or GSTR-2 configured to group the vouchers based on description, the consolidated values of vouchers appeared with the Description of the stock item selected in the last voucher. This issue is resolved. ● The status marked as New for invoices Available only in books, was not retained when the GSTR-2 report was saved. This issue is resolved. ● In a sales invoice, if the HSN Description was not defined in the sales ledger with the Type of Supply as Services, the party name appeared in the Description column of the HSN/SAC Summary. This issue is resolved. ● The drill-down report of the Nil Rated Invoices - 8A, 8B, 8C, 8D table of the GSTR-1 report will display the terminologies as per the GST Offline tool. ● The values of the journal voucher recorded for Reversal of Input Tax Credit with Exempt and non-business supplies - Rule 42(1)(m), did not appear in section B(1) As per rules 42 & 43 of CGST Rules of the GSTR-3B report. This issue is resolved. ● The error File could not be uploaded! Download the latest version of Offline tool to generate the JSON file or ensure to validate your uploaded file against the template published at Specification Portal appeared while uploading the JSON file to the portal, generated from the GSTR-2 report in Tally.ERP 9. This occurred when the decimals in the quantity field of the HSN summary table had more than two digits. This issue is resolved. ● The values in the journal voucher recorded to increase the tax liability and tax credit of a purchase made from an unregistered dealer, appeared with a negative sign in the GSTR-3B report. This issue is resolved. ● Now Myanmar, Liberia, Sierra Leone, and the United States of America have been added to the List of Countries along with the corresponding currencies. ● The ledger name appears compressed in the invoice printout when the name has more than 24 characters. This occurs in contra, payment, receipt, and journal vouchers. This issue is fixed. ● In the Invoice Print Configuration, the option Print alternate quantity? was enabled even when the option Print quantity column? was set to No. This issue is fixed. ● Fixed alignment issues in sales invoice printout. This occurred when GST was enabled, and alternate quantity, description, and billed and actual quantity columns were enabled in the print configuration. ●The Tax Classification Details screen did not appear while remotely recording a transaction in the accounting invoice mode. This issue is fixed. ● When a sales order was tracked using a delivery note, GST values were not updated if the quantity or rate of the stock item was altered. This happened when the option Consolidate stock items with same rates was enabled in Delivery Note Advanced Configuration. This issue is fixed. ● Fixed an MAV error that appeared when the height and width of an invoice were changed in advance print configuration. If an invoice was configured to be printed in multiple copies, the same number of copies was sent to a single recipient while e-mailing. This issue is fixed. ● The Payroll Autofill option did not appear in payment vouchers recorded after 1st July 2017. This occurred when GST, payroll, and purchase or sales orders were enabled. This issue is fixed.